" I loved how the kids chanted my son's name as he walked in the room. He felt very special. Our party pro was amazing. He took tons of pictures, engaged with the kids and again, made my son feel special. Our party pro was outstanding. He alway had a smile on his face and really got in there with the kids"
"If you want your kid and their friends to have a great time, play themselves to exhaustion, eat pizza and cake together and pass out with a smile on their face in the car on the way home...Definately do this!" "I asked for the party helpers to not shout or turn off the lights or scream beacuse my son has some sensory issues. They were great and accommodated my requests. We always recieve excellent service from the staff here. Thank you!" "Our party pro treated our daughter like a princess and she continues to talk about the experience she had with bounce-u. Thank you for making it memorable for her birthday!!" "I was in need of finding a field trip for my after school program last minute. The staff were so kind in scheduling and hosting a bounce party for us. My kids had a great time and the staff jumped right in and played with all the kids." "Best party venue experience we have ever had and that includes going to other bounce places and game rooms. The fact that the staff handles everything and just lets the parent be a part of the fun is an awesome thing. My son was absolutely over the moon with excitement." "The staff that worked the party was awesome! That's why we gave a big tip! "As a coach's wife, I tend to plan all end of season parties. This was the easiest by far from start to finish. Staff was helpful in meeting and anticipating our needs. We did not have to lift a finger.Best Party Ever!" 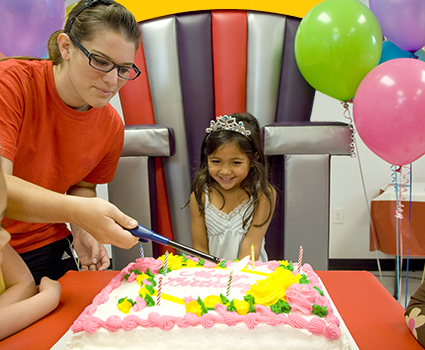 "I am normally SO stressed during Birthday parties with serving and entertaing and transitioning between activies. This was an amazing experience. Our hosts were more than on top of things. No detail was left out. You guys rock! "It was above and beyond what we expected. This was hands down the best party we ever had for my kids! "This is our 2nd party there and I'm sure we'll be back next year. The party staff assigned to our party were the best I've ever seen. They kept the kids under control but played with them and kept them excited the entire party. They were energetic, professional, and fun!" "From the first phone call until the end of the party, everything was smooth and enjoyable. The party assistants were joyful and made the party a great success, they even got my oldest son to act like a kid. I would definitely recommend having a party here." "It was super organized and made my daughter feel so special. Thank you!" "Our hostess was AMAZING. The help she gave in the party room was fantastic. She didn't want me to lift a finger.. She helped with gifts.. And just made it an overall awesome experience." "Everyone was so nice and very helpful!! I love using BounceU for my kids birthdays!! I feel like I am able to enjoy the party while the staff handles all the other issues!! I have booked many birthdays here and will continue to!" "Organizing the trip was painless! The staff made sure we were prepared and clear with all of the rules and information. When we arrived to the party room everything was organized. It was so great for us teachers to smoothly transition from the bounce room to the party room." "It's her 3rd birthday party in a row there. Enoughsaid! Always Awesome. You do a great job training and selecting your staff! They are always Clean cut and polite kids!!" "The entire party went amazing! I never had to worry about anything! Watching my children enjoy the party made it worth it! Our little man really enjoyed the party pros we had once he became King and helped with opening presents! Thank you Bounce U for another great party!" "They though of everything! No detail was missed. My husband even said that this was the closest thing to Disney World in terms of doing a great job!! They made my birthday boy feel so special (especiallyletting him choose lights off for the birthday song)!" "The helpers were very polite, sweet, organized, etc. Everyone including myself was beyond impressed. I couldn't believe that I didn't have to do one thing during this party."